3 months of intense work sessions, access to a platform with strongly established collaborations and partnerships, and one of a kind experience. Scylla has been fortunate to be a part of the Startupbootcamp Smart City & IoT program Amsterdam. Startupbootcamp, the leading global network of innovation programs accelerating startups and scaleups worldwide, gathered 9 of its talented startups from the Smart City & IoT Class of 2018. On October 18th, they all came to the Johan Cruijff Arena in Amsterdam for “Smart City Experience” Demo Day where they talked about what they have accomplished so far and their continued plan in the security and sustainability space. Demo day is a celebration of the past 3 months of intense work by the graduated cohort of 2018 startups, filled with inspiring talks, giving them all a platform to showcase their successes. The focus of the event is on security, sustainability and efficiency. It was hosted in partnership with EIT Climate-KIC, EIP Smart Cities & Communities (an initiative of the European Commission) and City of Amsterdam. It provides an international platform with over 250 key stakeholders, influencers, mentors, investors, and partners coming from the public and private sector, the people who are all dedicated to building safer, more efficient, and sustainable smart cities of the future. Manuela Krull, Managing Director of Smart City & IoT Amsterdam is convinced that challenges caused by the growing amount of people living in cities are something that we should all be concerned about. ‘’It’s not only about the accessibility of the city but also about physical and cyber security and sustainability. In the Startupbootcamp Smart City & IoT program, we have been looking for the best startups who could contribute to the solutions for these challenges. Since Smart City is a topic of both, the private and the public sector, we were very pleased to have been working during the program with important organizations from both groups’’. Albert Stepanyan, CEO of Develandoo AI (DVLD) innovation lab where Scylla was developed, noted the Startupbootcamp program provided an extensive network of partners, industry leaders and industry knowledge which Scylla could and has leveraged as well as provided. ‘’It was a really well-organized event with lots of networking and a nice after party. It’s also very exciting that we will get access to the Alumni network with more than 700 companies involved’’. The event was organized in a way where those at experiential booths had an opportunity to get to know the startup owners and deeply understand the products they are building, by being able to try their solutions/applications at the event itself! With the brella app, guests could easily pre-schedule meetups with one another. Over 140 meetings took place that day, with 59 of them involving our startups. We believe we would call that a success. Here are the 9 startups that took part in the event. These top 9 companies from Startupbootcamp Smart City & IoT program took part in an intense 3-month acceleration track of workshops, mentor sessions, and events, starting on the 2nd of July 2018 and ending with the Smart City Experience showcase. Supported by the network of corporate partners VodafoneZiggo, PwC, Schiphol, Unica, and Sandd, the startups have made impressive progress. They all have working software products and initial verbal agreements or even signed contracts with their clients. There were even some cross collaboration alliances between the startups. 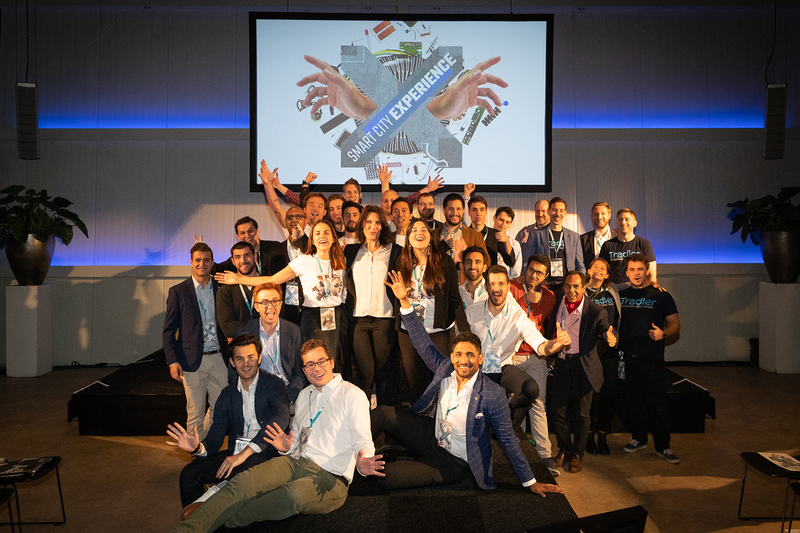 After their acceleration in Amsterdam, the startups will join the Startupbootcamp Global Alumni growth program, connecting over 700 startups worldwide. Scylla monitors real-time video streams to predict violent behavior and identify acts of violence. Artificial intelligence, computer vision, and machine learning are used to identify, analyze and respond to threat quickly and accurately. We help response teams take immediate actions to reduce the number of victims from violent crime, active shooting events, and terrorist acts. We intend to revolutionize the security and surveillance industry. For more information visit https://scylla.ai/#scylla. Launched in 2015 in Amsterdam, Startupbootcamp Smart City & IoT is a leading global accelerator focused on the innovation in the Smart City & IoT industry. Supported by a strong network of major corporates, as well as an extensive mentor, investor, and alumni group from all over the world, Startupbootcamp Smart City & IoT is a part of the global award-winning Startupbootcamp, a network of industry-focused startup accelerators.